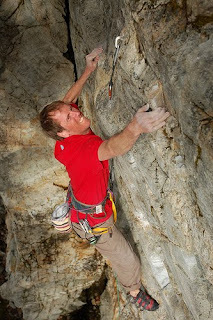 Shuswap Climbing: Revelstoke Rocks - yes it does! Revelstoke Rocks - yes it does! I received an email from Ruedi Beglinger about the new guidebook, written and published by Ruedi himself covering "All the rock climbing in Revelstoke area below tree-line." It is a substantial continuation from the last print of it and adds many new routes, re-grading, and new areas including Three Valley Gap, a new wall at Water World area, a new crag at Blanket Creek and more, probably a lot more. The new guide book will be available in early April 2010. It will have around 200 pages with 286 routes and over 400 pitches. There is (this is gonna be awesome) a 16 pitch climb featured as well! Revelstoke is an awesome place to climb. If you haven't been there yet, go. Spend a few weekends there. The climbing ranges from 5.5 to 5.12d with one route, 5.13b, yet to be freed cleanly. Sean Beale on Smokey And The Bandit (5.12a) at the Drive-In.